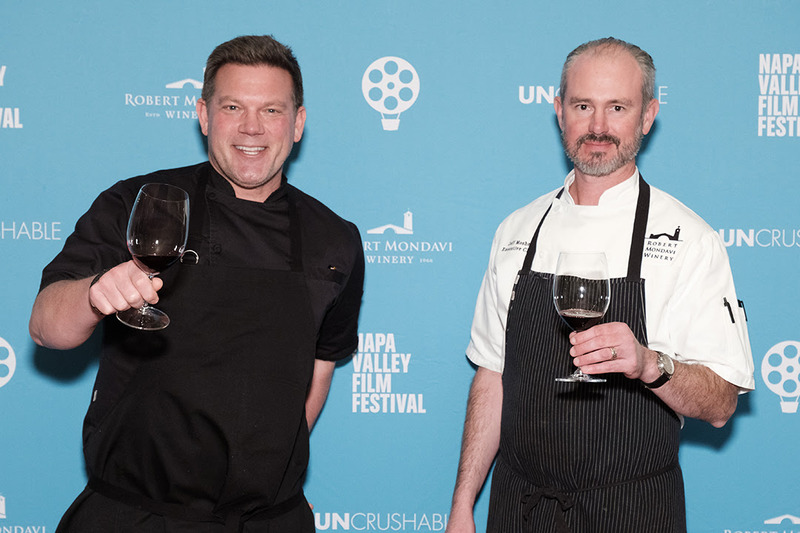 This year was the first year I attended the Napa Valley Film Festival. 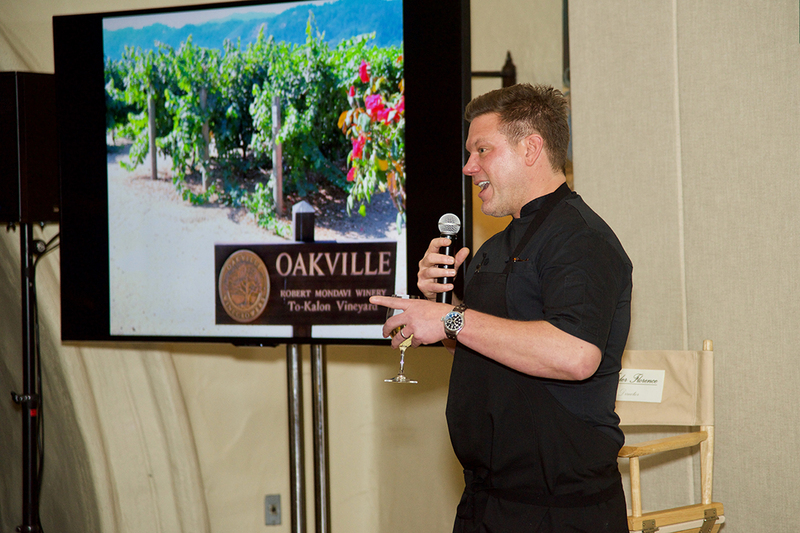 As part of the festivities, I had a blast attending Tyler Florence’s Uncrushable at the iconic Robert Mondavi Winery. As you may recall I’ve been to Robert Mondavi before for an incredible winemaker dinner two summers ago where winery Chef Jeff Mosher and visiting New York Chef Theo Friedman cooked an incredible meal together, paired with a lineup of exceptional Robert Mondavi Wines, which we enjoyed on the terrace overlooking the historic To Kalon Vineyard. Read more about that fabulous evening here. 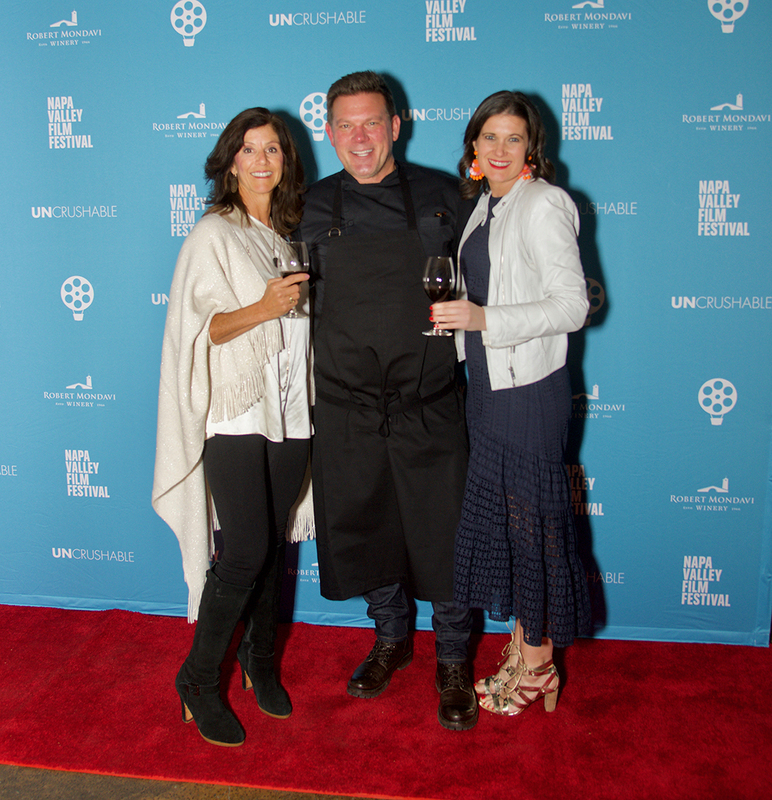 Red Carpet fun with the Folsom PR ladies and my friend, fellow wine writer, sommelier and wine expert of Sawyer Sommelier. 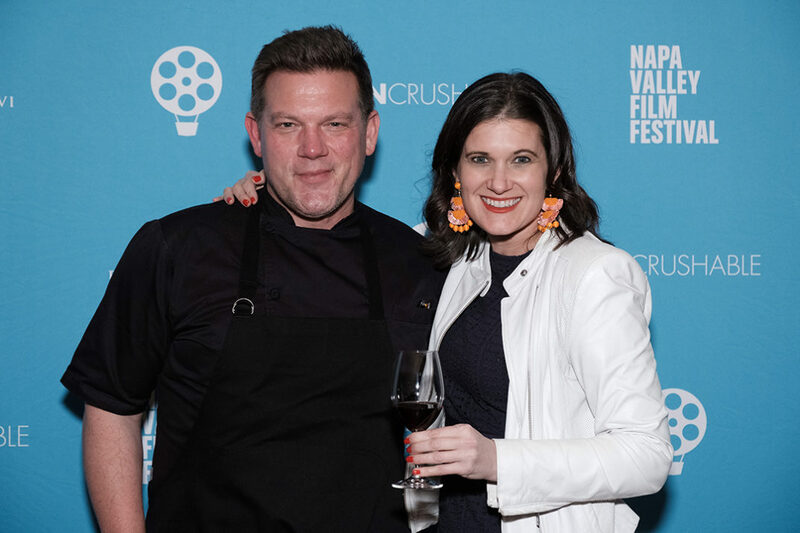 Me and new friend, Editor in Chief Laura Levy Shaktkin of Napa Sonoma Magazine and Chef and Film Producer Tyler Florence. I have met Tyler various times over the years at Culinary events and he’s amazing. 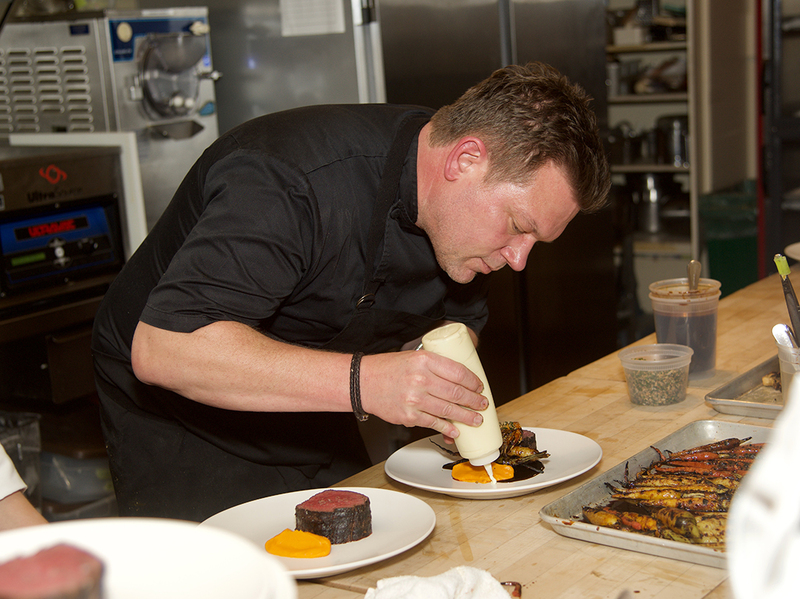 He’s always super friendly, approachable, engaging, a talented Chef and does really great things within the community. I was beyond thrilled to be one of the forty guests at this intimate evening raising money for the victims from last year’s North Bay Fires. 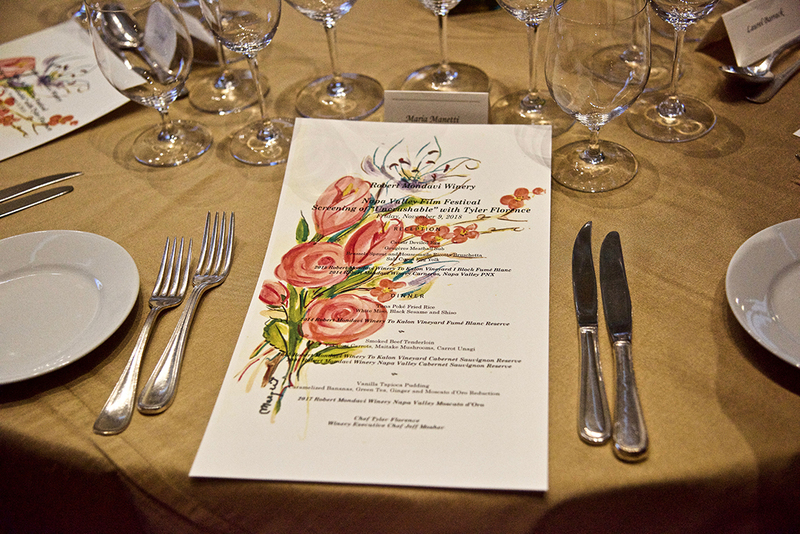 The stunning menu included a vintage drawing that was created by the late Margrit Mondavi. 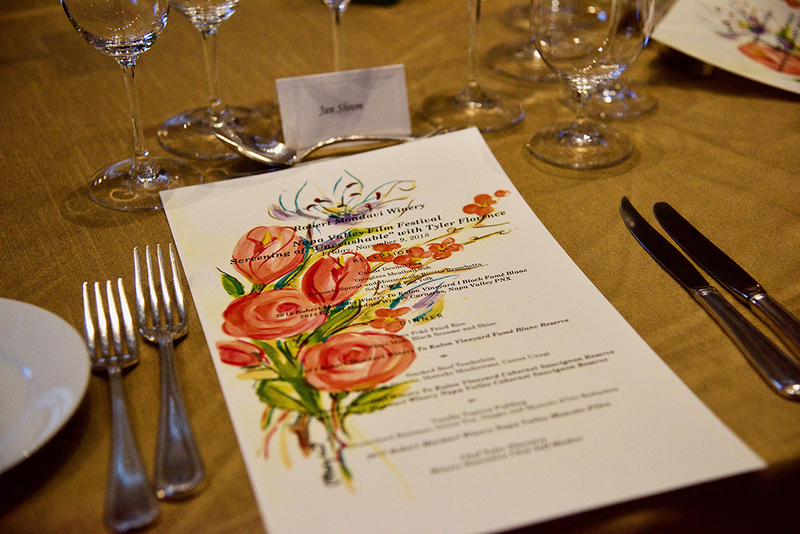 The Mondavi team continues to share her beautiful artwork at winery events – a tribute to her creative spirit. I loved this stunning thoughtful touch; it almost made it feel like Margrit was still with us enjoying the special evening. 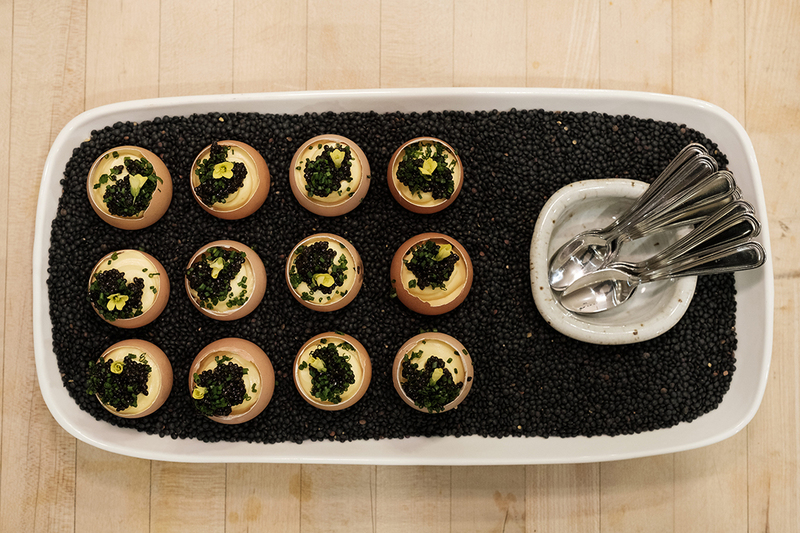 The Caviar Deviled Eggs, a signature Chef Tyler dish, was a delicious mix of creamy and briny with a crunchy crouton base. 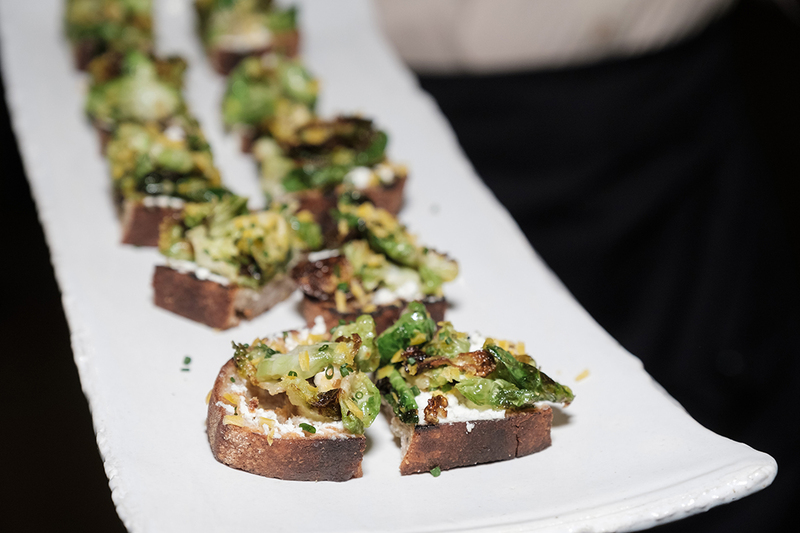 Another fabulous appetizer was Brussels Sprouts House Made Ricotta Bruschetta. So so yummy! 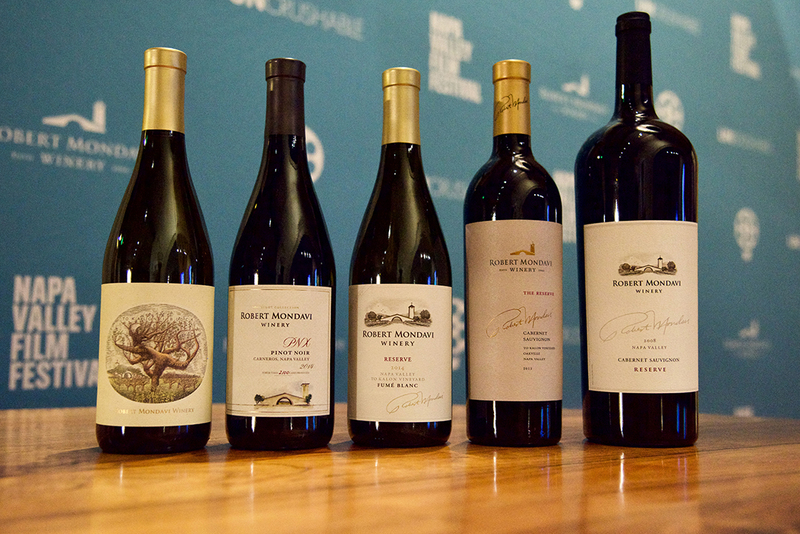 Here’s the lineup of fabulous Robert Mondavi Wines we enjoyed throughout the evening. 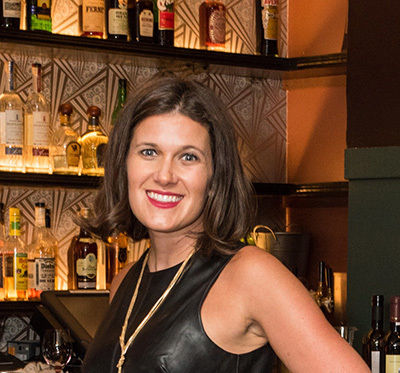 I really loved tasting and comparing the 2015 and the 2008 Cabernet Sauvignon Reserves; it’s fun to discover the age-worthiness of this wine and to see how it evolves in the bottle over time. I adored them both but if I had to pick, the 2008 was beyond stunning and almost ten years old. Amazing! 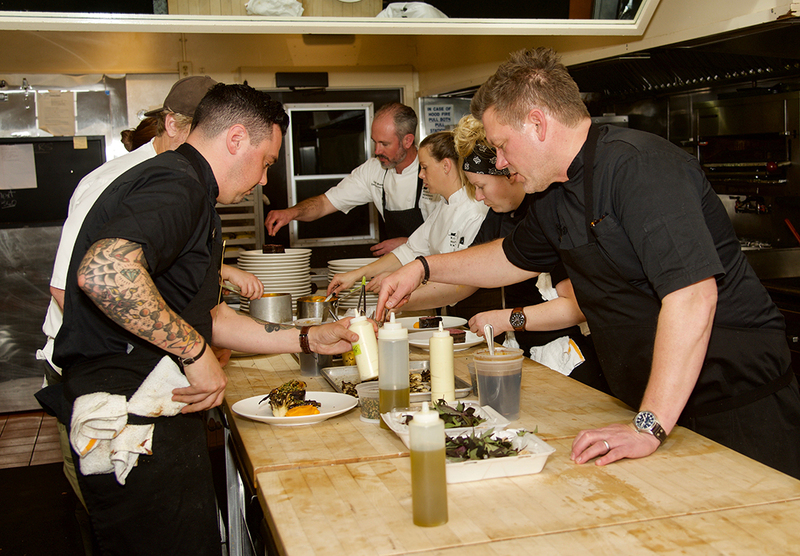 The Robert Mondavi Winery and Tyler Florence culinary teams hard at work! 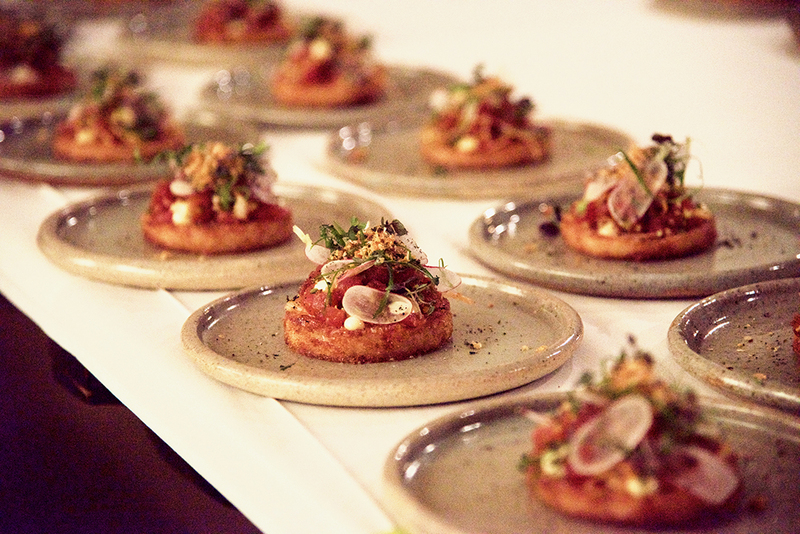 This was my favorite dish of the evening: Tuna Poke with Fried Rice. It was beyond flavorful, had an amazing crunch and it was just delicious! 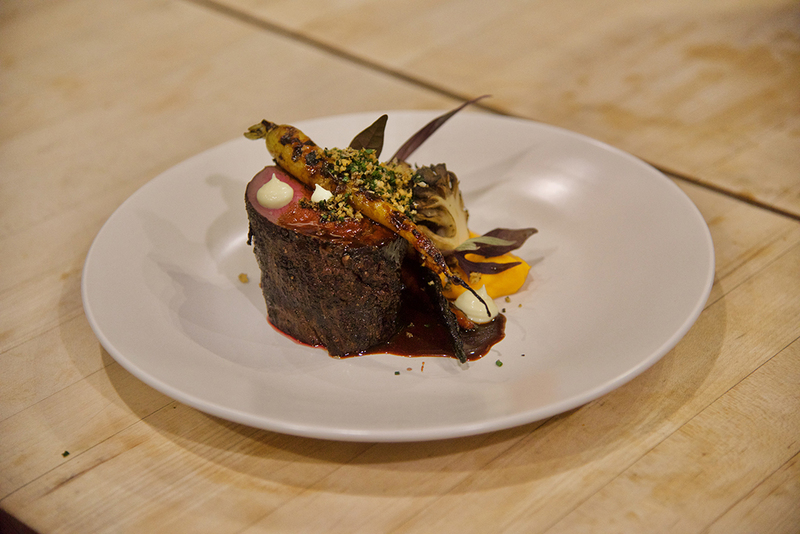 The entree was an exquisite Smoked Beef Tenderloin. 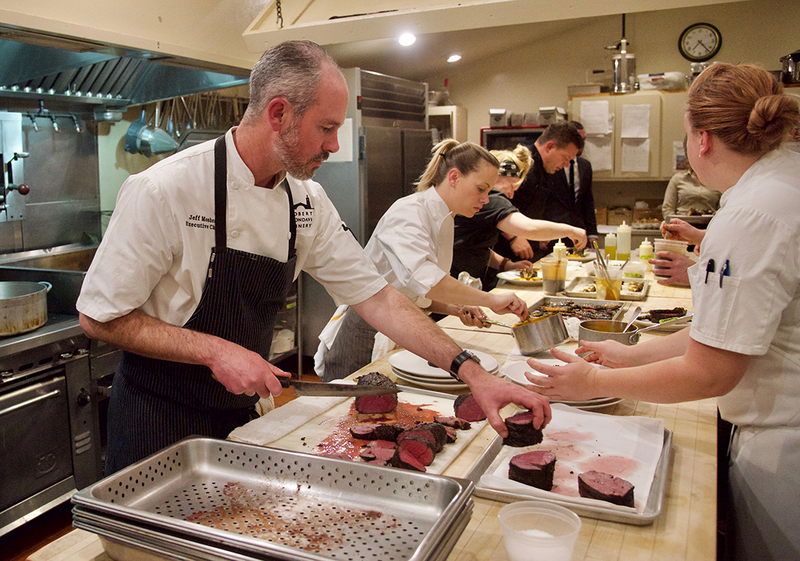 Chef Tyler came by our table and shared with us the secret to its deliciousness: slow smoking of the Wagyu beef tenderloin at a low temperature for four hours. 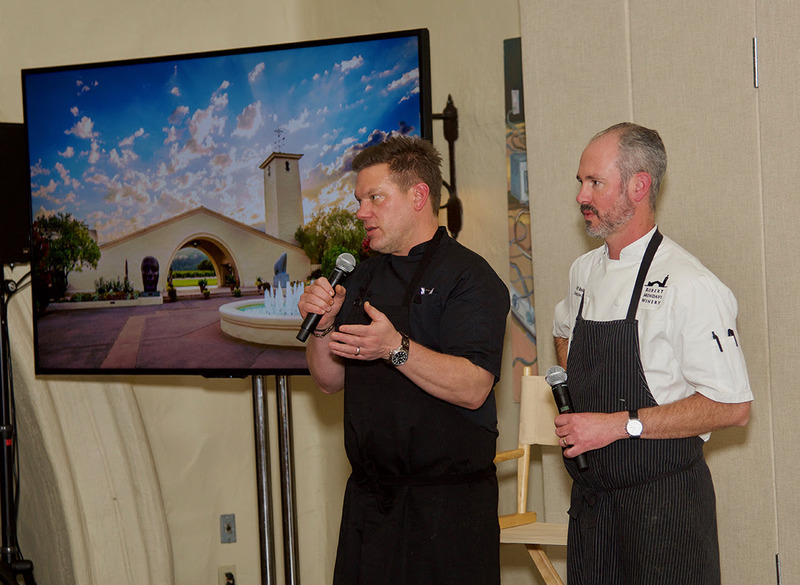 A huge thanks to the culinary teams lead by Chef Tyler Florence and Robert Mondavi Winery chef Jeff Mosher. 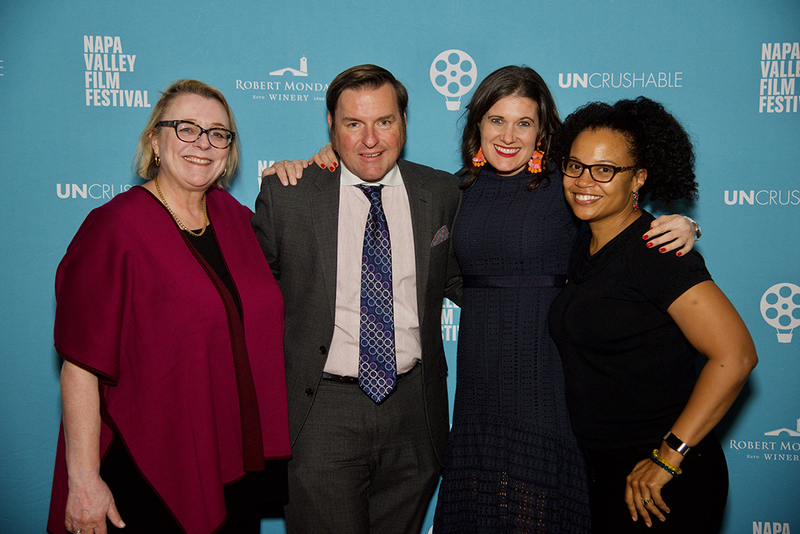 This was a night I will treasure, not only because of the amazing food and wine pairings, but it was special seeing UNCRUSHABLE for the first time in this setting with Producer Tyler.